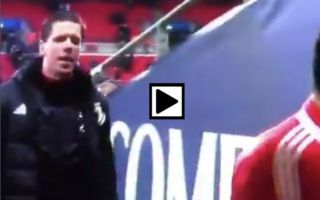 Juventus and former Arsenal ‘keeper Wojciech Szczesny was caught taunting Spurs supporters following their defeat to the Italian side that saw them get knocked out of the Champions League. The Old Lady defeat Mauricio Pochettino’s side 2-1 at Wembley tonight, meaning that they advanced to the quarter finals with a 4-3 aggregate win over the north Londoners. Following the match, Szczesny was seen mocking the home fans after the result by signifying that they keep their heads up, something that is most likely down the fact that he used to play for their fierce rivals, Arsenal. Before securing a move to Turin, the Polish shot-stopper managed to amass a total of 181 appearances for Arsene Wenger’s side, an impressive feat in modern day football. After this cheeky bit of trolling from Szczesny, we think Spurs fans will hate the Polish international more than they did when he played for the Gunners. Here’s a clip of Szczesny mocking the Tottenham supporters after the match this evening.